Cycling is a popular activity that has been growing in popularity. Some people engage in it for recreational purpose, others as a fun activity, while there are those who do it as a competitive sport. Whichever your reason for cycling, you need to wear the right short. A poor type will not only make you feel uncomfortable, or affect your performance, but can also cause friction and even harm your skin. Poor choices include a type that is too light, too thick, too short, or too long. The material, padding, seam, design, and material should also be right. 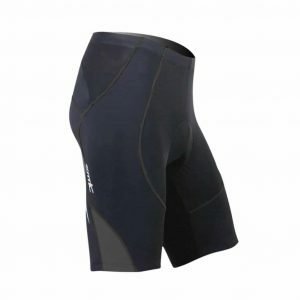 This review looks at the key features of a good product and summarizes the top 10 best cycling shorts for men in 2019. Material: Cycling puts a lot of strain on the material especially in the groin region. A good material will be more tolerant to wear and strain but still offer good comfort and aeration. Nylon, Lycra, Polyester, and Elastane are among the common materials. Design: The shorts come in varied designs to suit the riding style, terrain, individual preference, emerging trends and more. It pays to first understand all these before settling on a product. Comfort: A good pair of cycling shorts will fit comfortably and won’t feel too tight or too loose. It also won’t ride up or lose shape due to regular use and washing. Chamois: This is the padded section on the shorts that protect your midsection from the saddle. It shouldn’t be too thin such that it offers little protection or too thick that it makes you uncomfortable. Size: Always choose the right size depending on your hip and waist size. It’s important to note that the sizes may vary from manufacturer to manufacturer and its advised to seek professional help. UV Protection: cycling exposes you to the harmful UV rays from the sun. A good short will protect you from the effects and should have at least UV 50 plus protection. The Beroy Custom cycling shorts are no strangers in top reviews. They occupy the first slot for many reasons but the following are the most obvious. They are strong courtesy of the 82.4 % polyester and 17.6% spandex. With a weight of 200g/m2, they are light and offer good sweat absorption and breathability. Also, the 3D gel padding is not only comfortable but also protective. Other notable advantages include good density (80kg/m3), strong hems, doesn’t ride and are easy to wash. According to some people, the spandex is moderately thin, there is no elastic on the leg opening, and can be a bit see-through for people with very large thighs. This cycling short is ideal entry-level for riders who are beginning because it has highly stretching fabric, Powerband compressive cuff and flatlock seams. It is furnished with an Italian-made chamois which is comfortable and provides enough padding for a wide range of cycling paths, trails and roads. It is also equipped with Coolmax top sheet for healthier wicking and moisture management also has high-density Multi-thickness foam for better ergonomics and support. Its chamois adapts ergonomically to your body and two-way stretch delivers a decent fit and contour when riding. If you are an amateur on cycling, you should not hesitate to pick this item, because it has a seat pad that is thicker that is suitable for you. We profoundly recommend the utilization for long distance rides. Its leg opening is outfitted with the Italian hostile to slip belt; it can lessen the friction amid the long distance riding. It has a Mesh Panel that helps you when you work hard; you will experience breathability and fast dry. The main reason behind why you may need to consider these shorts is the seat cushion that is thick enough to give enough solace to long rides and it doesn’t feel awkward when you are walking with it. Made with a specialized formulation of materials, the Eco-daily Men’s Cycling Shorts will allow sweat releasing breathable and moisture wicking, moisture absorption, and fine air permeability. This will prevent any senses of discomfort and sticky whenever you are riding. With this in mind, this men’s short has 3d protection pad and engineered with laser-cut rounded edges and four-way stretch for a chafe-free and smooth feel. The 14-Panel anatomic design will assist to lessen fatigue as well as increasing blood flow on the muscles when you are biking. 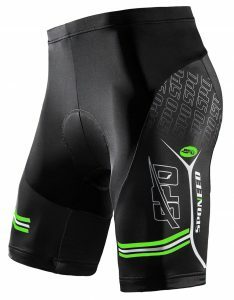 If you are searching for truly professional cycling shorts for the value of your money then you must consider these. 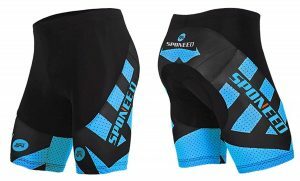 Sponeed Bike Shorts usually permits you to bike for long distances; it has a spandex lycra material that is elastic and breathable for ultimate comfort and perfect fitting. The sublimation print is well done utilizing Italian ink to make sure that this short does not fade out. It has a soft touch making you to feel much comfortable. The short can be utilized by any cyclist. Every time you are sweaty, this short never stick on your skin, it contains a fast-dry feature that makes you feel very comfortable. It’s also designed with materials that are skin-friendly. Get through your toughest and longest bicycle rides with this Dinamik’s Bicycle Mens Shorts. With its chamois padding, breathable elastic fabric, premium moisture wicking and more, you can easily ride at your best. The chamois gel padding gives extra help right where you require it, and prevents the fabric from bunching up making you comfortable while you ride. 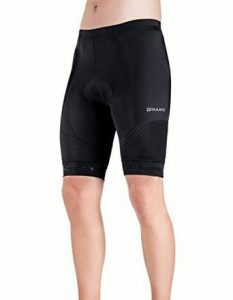 The second skin fit usually fits of these bicycle shorts and prevents the friction from riding in one position for a long time, it also reduces the wind drag and this improves speed. 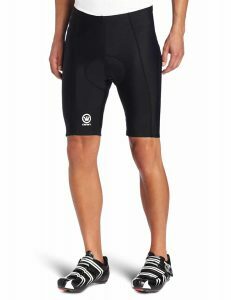 Another men’s shorts perfect for any outdoor activities are SLS3 Triathlon Men’s Cycling Shorts. Featuring drawstring and elastic waistband, short will stay in place and allow for a comfortable fit without squeezing your legs. The foam-cushioned pad offers great support throughout your biking and thanks to it’s our 2 side pockets that you can use to keep your iPhone. The Shorts has flexible fabric that usually stretches in ALL directions and this makes it very comfortable and you will not feel like you are wearing them. It’s likewise slim and light thus will not slow you down when riding. Enjoy cycling freedom and by wearing the Canari Cyclewear men’s short. They are made of 82% nylon, 18% spandex, and come is an 8-panel anatomical design. To boost your comfort and minimize injury while riding or seating on the saddle, the shorts are padded with Velo gel. They can be washed by hand, washing machine, and hung dried. You should consider these shorts because they are well made, comfortable, have good shock absorption, and durable. On the contrary, the padding is somewhat thin, may feel loose for very slender people, and is not bleach-friendly. 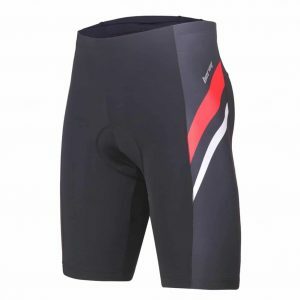 The Sponeed cycling shorts come in different sizes to suit various users. All are however made from 80% Polyester and 20% Lycra. This combination makes them smooth, soft and elastic at the same time. The Chamois consist of 4D gel pad that is known for its comfort and durability. And to improve air circulation and reduce sweating, the shorts come in an easy-breathe design. 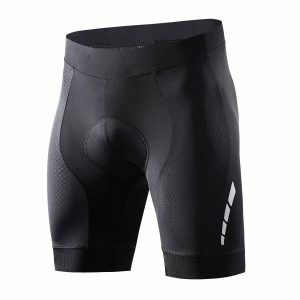 The Sponeed cycling shorts are liked for their comfort, seamless nature, quick drying, and don’t ride up. They, unfortunately, are very light, a bit long especially for shorter users, a can be affected by bleach. These cycling shorts include a combination of Lycra, spandex, and nylon material. They likewise have UPF 50 sun protection. If your ride is shorter, longer, or nix, you will acknowledge its sweat-wicking material and breathable mesh design. 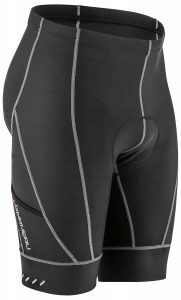 The short has a two-panel, smooth construction and the seamless pad which decreases the chances of saddle sores and abrasion. Its surface has a cool and smooth microfiber which is best for cycling. These shorts additionally accompany a 12-panel pad to enhance comfort. As a cyclist, you should find this top 10 best cycling shorts for men in 2019 review a good guide for your next shorts. We rounded the best products and carefully picked the best-of-the-best. When wearing them, cases of feeling uncomfortable, your skin chaffing, aches in the groin area due to the hard saddle, or the shorts riding up will be a thing of the past. You also don’t have to worry about them shrinking or expanding over time and wearing out too soon.